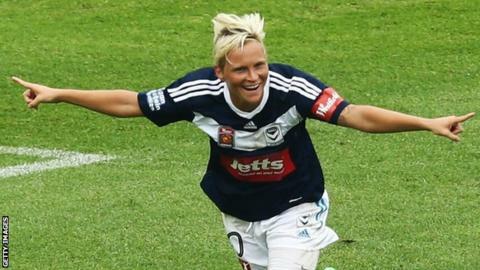 Wales Women captain Jess Fishlock has won two awards for her Melbourne Victory efforts in Australia's W-League. Fishlock, 27, was named player of the year in Australia's top flight by the nation's Football Media Association (FMA). And she was also voted players' player of the year by her peers. FMA president Ray Gatt said Fishlock is a crowd favourite who was influential in her team's title win. Fishlock, who is currently playing for Seattle Reign, described the awards as a "huge honour". The inaugural FMA award in 2013 went to Sydney FC's Samantha Kerr, leaving Fishlock as the first non-Australian to win it. Fishlock took the vote in a seven-strong FMA shortlist.